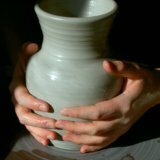 Best site for ceramic coffee cups, mugs, and pottery. 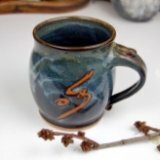 Find ceramic coffee cups or unique ceramic mugs for sale, or better still, learn how to make your own. For use around the house, smaller ceramic coffee cups are ideal and go well with lids and saucers. Smaller coffee cups can be similar to teacups, but are generally sturdier. My favorite cup is a simple 2 1/2 inch high by 3 1/2 inch wide round bottomed cup. It has a lid and a saucer, but I generally just use it on it's own. It has a little round handle that fits one finger and holds one measuring cup worth of coffee. The thing I like most about it is that the coffee cools off faster than in a big mug so I can get to drinking it right away. However, I can top it off frequently with hot coffee, so it's always the perfect temperature. 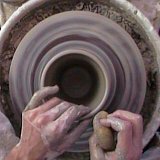 Making small cups is pretty similar to making large coffee mugs, except you use more clay and modify the shape of the mug. Smaller cups are often wider than they are tall to allow your nose to go into the mug while you are drinking. Narrower cups work too, but they're aren't as easy to drink out of. 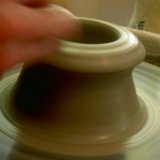 I recommend trimming the base of any clay pot projects to create a nice finished look to it. This is more important on a small cup because the base makes up proportionately more of the pot than on a larger mug. For the handle, a small loop, big enough for one or two fingers is sufficient. On a larger mug two fingers are usually necessary. This can be hand pulled or rolled into a simple coil of pottery clay then attached. You may also want to check out how to make your own ceramic coffee travel mugs. Try making one with a lid and saucer, great for keeping your tea or coffee hot. See the clay pot projects butter dish page for tips on making a lid.